Dyslexia means "trouble with words." Recently, however, it has been further categorized into many different labels including ADD, ADHD, visual-spatial learners, processing disorders, etc. As more is learned about the commonality in thinking styles among all of these,there is a consistent theme with respect to many learning disabilities: Disorientation. Disorientation is actually a natural talent - a gift. When disoriented, dyslexics can problem-solve, create, invent, engineer, and escape by using their extraordinary and vibrant multi-sensory thoughts, similar to movies. This same gift, however, is also what makes dealing with 2-dimensional words and symbols a tedious task. Disorientation affects many areas of learning such as reading, spelling, comprehension, writing, and math. Because many written words and symbols are abstract, and cannot be deciphered by their natural picture-thinking style, dyslexics become confused. When confused, their automatic response is to disorient and examine the source of the confusion multi-dimensionally. This works beautifully with real-world objects, but it doesn't work for the written word. The result of disorientation while reading is distorted perception of the words - causing frustration, mistakes, loss of comprehension, and fatigue. This video is a great demonstration of how it feels to read as a dyslexic. When equipped with the right tools, people with dyslexia can intentionally control and correct their perceptions and avoid the disabling aspects, allowing their gifts and talents to shine. 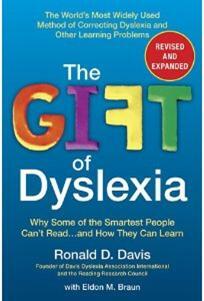 Read more about how Davis Orientation Counseling™ provides tools for correcting perception in Ron Davis' breakthrough book, The Gift of Dyslexia. How does disorientation affect reading, spelling, comprehension? It can cause a dyslexic to perceive words on a page strung together, with no spaces, making it nearly impossible to decipher words within it. "hovering" or even sliding off of the page. omission of words in the text). It can cause transpositions of words, like: was/saw, on/no, from/form; as well as transpositions with individual letters within words, like: b/d/p/q, f/t, u/n. The severity of the symptoms varies with each individual and the symptoms of disorientation vary from day-to-day and minute-to-minute, depending upon the situation. Bottom-line: Disorientation prevents the information from being perceived accurately.